I've talked before about why where you donate matters. Well I am excited to announce that Central Carolina First In Families has a great fundraiser coming up this month: a benefit screening of The Crash Reel. It is an action-packed documentary film about snowboarder Kevin Pearce: his Olympic dreams, fierce rivalry with Shaun White, the devastating crash that nearly cost him his life, and his recovery from Traumatic Brain Injury. 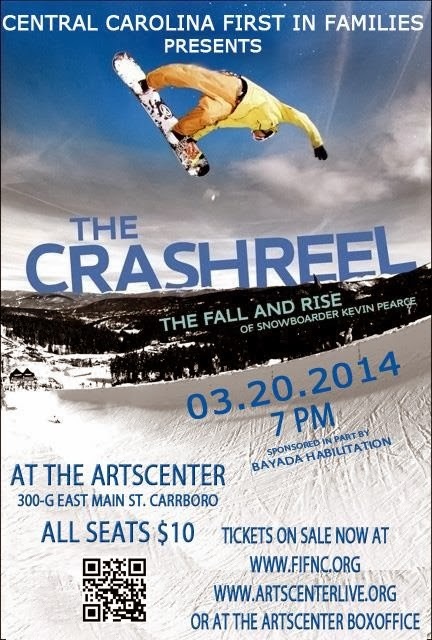 The benefit screening is one night only: Thursday, March 20th, 2014 at 7pm at The ArtsCenter in Carrboro. Advance tickets are available at The ArtsCenter box office or order online through First In Families. Central Carolina First In Families provides support to individuals and families in Orange, Chatham, and Person Counties affected by developmental disabilities or Traumatic Brain Injury. March is also Traumatic Brain Injury Awareness month. For families in our local autism community, CCFIF is a great source of grants for summer camp, therapy, and other needs. By buying a ticket to The Crash Reel, you are supporting a fantastic cause and getting to see an incredible film - definitely a win-win! Can't attend? Please consider making a donation to Central Carolina First In Families. And spread the word about this exciting event by joining the Benefit Screening of The Crash Reel event on Facebook (and invite your friends too! ).